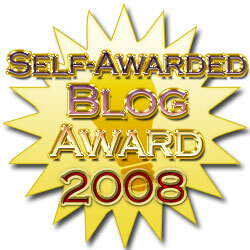 So here it is….the winner of the 2008 Self-Awarded Blog Awards…..the Architectural Lighting Blog! Boy am I getting punchy or what? This entry was posted in General and tagged architectural design, architectural led lighting, architectural lighting, architectural lighting design, Architectural Lighting Industry, artistic lighting, award winning blog, blog award, blog wards, building daylight, building technologies, building technology, commercial lighting design, commercial lighting tools, daylight consultant, daylight consulting, daylight planner, daylight planning, department of energy, designing with light, DIALux, doe, doe tools, doe utilities, energy analysis, energy analysis tools, energy efficient, energy policy tax, energy savings, energy utilities, free, free design software, free lighting design software, free lighting software, free lighting tools, free lighting utilities, free program, free software, free web tool, led architectural lighting, lighting artist, lighting design, lighting design software, lighting designers, lighting engineering, lighting plugin, lighting software, natural building light, Office Lighting, plugins, retail lighting, retail lighting design, retial store lighting, Solid-State Architectural Lighting, solid-state lighting design. Bookmark the permalink. That is some funny stuff. I need to give myself an award too! I might even use your picture for my shameless self promotion. By all means Lief go right ahead and use away! they make all kinds of commercial chandelier! What other lighting blogs were in the running for this award?